Should singles change their zip codes while looking for love online, or even take it further by moving to a more desirable state in the country? 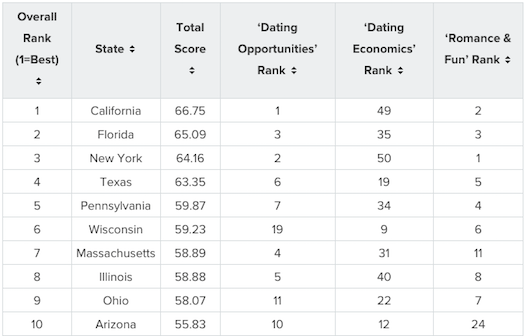 A new study from WalletHub actually ranks all 50 states to determine the best and worst places for single daters. The list breaks it down further into four categories. If you’re attached to your mobile phone and find yourself swiping left and right on mobile dating apps, the study shows a different digital picture. Overall, California ranks as number one on the list. Perhaps the sunshine, Rose Bowl, and Disneyland contributed to that score. Just behind California is Florida, with New York coming in at number three. Arkansas ranked at the bottom of the list as the worst place for singles. This list shows the top 10 ranked states in the country. This map below, highlights each state to see where they rank. Click on your state to find out the overall rank, and think about casting a wider net while looking for love online. Julie Spira is America’s Top Online Dating Expert and Digital Matchmaker. She’s the CEO of Cyber-Dating Expert and has been coaching singles on finding love online for over 20 years with her Irresistible Profiles programs. When you’re single and really want to meet someone, you’ll say that the city you live in is the worst city for dating. Whether it’s the cost of the movie ticket (California was the worst), or the price of going to a beauty salon or to a bar for drinks, find out what challenges you might have in the city you reside in. Better yet, I always recommend casting a wider net and changing your zip code to another city. Why not move for love? Why not go on a date when you’re traveling in another city? So here’s the news in a digital nutshell. The highest movie ticket costs and highest beauty salon costs were all in California. So yes, dating in California is expensive. Thinking of moving to another city to find love? Check out how they rank here. Are you interested in their other findings? Here’s the full list, so you can decide where to go searching for dates before opening your wallet. 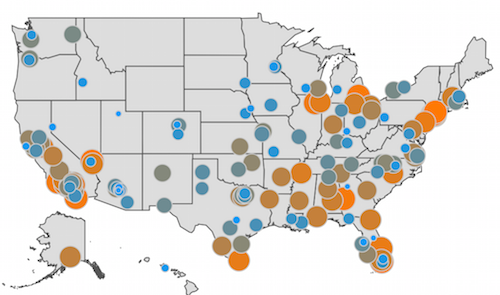 Where does your city rank on this list? Need some extra hand-holding? You’re not alone. Find out how our Irresistible Profiles and SwipingRight programs can help you find your dream date. Follow Online Dating Expert @JulieSpira on Twitter, Instagram, Facebook, and sign up for the free Weekly Flirt newsletter.